Give your digital display applications the "wow" factor they need to reach audiences with maximum impact with the 40” NEC MultiSync LCD4010. This next generation large-screen LCD features the exclusive Digital Signage Technology Suite (DSTS), which boasts many advanced features that take its display performance to uncharted levels. Includes PC inputs via VGA, DVI-D, and RGB (BNC x 5), and Composite (RCA), S-Video, and BNC Component Video. Dimensions 38.7" x 22.8" x 5.5"
Dimensions w/ Stand 38.7" x 24.1" x 13"
Sized to please. With their spacious screens, MultiSync Large-Screen LCDs are ideal for applications that require precise readability and clarity from a distance, such as airports and financial institutions. The LCD4610 touts the largest screen size LCD commercially available. The LCD3210, which fills the gap between flat panels designed for the desktop and those intended for larger venues, offers digital signage markets a lower-priced option for a variety of visual display needs. Superior screen performance. MultiSync Large-Screen LCDs take advantage of the many display technologies that have made LCD monitors so popular over the years, and deliver them through expansive screens featuring a wide aspect ratio. Their 1366 x 768 (WXGA) resolution, which provides a true 16:9 aspect ratio, optimizes on-screen text, images and video with remarkable precision and clarity, allowing onlookers to clearly view presentations, charts, advertisements, pricing and other public display information. Further, applications can be viewed simultaneously, utilizing the displays’ picture-in-picture capability when using the defined combination of video inputs. In applications where spectators are situated at various angles in front of the screen or where they are passing by the display, the monitors provide an undistorted view of the screen. Using XtraView wide-angle viewing technology, the displays deliver flexible horizontal and vertical viewing angles (up to 176°; 88° up, down, left and right) with less glare, reflection and distortion. Exceptional contrast ratios help the displays deliver amazingly vivid colors, while automatic black level adjustment regulates grayscale images for optimal picture quality. Further, Rapid Response technology allows them to display virtually uninterrupted and undistorted viewing of high speed, full-motion video without ghosting or image trailing. Avoid Image Persistence. To alleviate image persistence, NEC Display Solutions developed a new panel design and employs many advanced technologies for its MultiSync Large-Screen LCDs. Some of these technologies include a screen saver function, a power-save function that puts the display in power management mode when a sync or input signal is lost, a side color function that adjusts black bars in 4:3 mode, a real-time clock for content scheduling and sleep/wake management and an image mover function. Achieve consistent, long-distance signals. 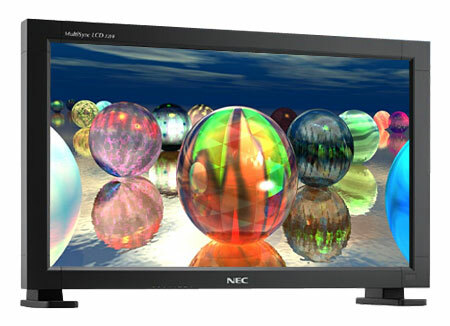 NEC Display Solutions exclusive CableComp technology (featured on the LCD4010 and LCD4610) enables users to realize the advantages of long monitor cable lengths without the difficulties and costs normally associated with this type of configuration. In environments such as trading floors, call centers and public signage venues, longer cables enable systems to be centrally located in control rooms far away from users (up to 326 feet/ 100 meters), allowing monitor upgrades, service and repairs to be accomplished without interrupting the work or display environment. CableComp technology solves signal and blurred image dilemmas by using a digitized signal delay circuit to automatically compensate for each red, green and blue cable’s length and video signal delay, ensuring sharp image reproduction. CableComp also boosts the VGA video signal to prevent blurred images without the need for costly repeaters. A new feature of this technology is its ability to equalize the video signal to eliminate color halos on long cable runs. Get connected. MultiSync Large-Screen LCDs feature a number of input connections for maximum compatibility. Both versions include a DVI-D connector for digital video signal adapters and a traditional 15-pin mini D-sub connector that is configured for IBM VGA-compatible adapters. This wide compatibility makes it possible to upgrade adapters or software without having to purchase a new monitor. By accepting analog signal inputs, the monitors can display more than 16 million colors, depending on the graphics card and software being used. The standard version display also features BNC VGA, composite video, component video, and an S-Video connector, allowing you to run numerous peripheral devices, including DVD players, media PCs and high-definition video players. User-friendly, efficient design. As ease of installation is a main concern for the information display market, these displays were designed with light weight in mind, making them simple to transport and install wherever necessary. In addition, NEC is on the forefront of mounting technology as the displays’ cabinets were designed to meet currently proposed VESA mounting standards for larger-sized public displays, which will be required of all manufacturers in the future. Their ability to be mounted in either portrait or landscape orientation further adds to your flexibility. With a uniformly thin frame, the displays’ designs are ideal for multi-screen construction for virtually seamless video walls. Intelligent power management ensures a smart investment. Utilizing energy-efficient technologies in their design, these displays reduce power consumption and significantly lower your total cost of ownership (TCO). The high-efficiency backlight reduces not only the power consumption but also the heat generation at the front of the screen, while the real-time clock’s sleep/wake management scheduler improves energy savings and extends display life.